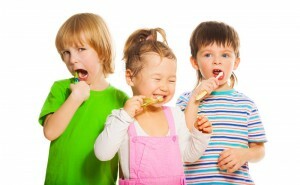 We offer dentistry for the entire family including child dentistry. As tooth decay is the most common childhood disease, early treatment is usually the most comfortable and effective way to provide your child with a positive dental experience. Crooked and crowded teeth are not only hard to clean, but they may lead to other more serious dental problems. Malocclusion, (bad bite), can affect speech and chewing ability, cause abnormal wear on tooth surfaces, and can lead to problems with bones, joints, and gum tissue. The emotional benefit of your child’s healthy and happy smile cannot be overstated. The most important consideration when it comes to child dentistry is their increased confidence in their smile and overall appearance. The optimal time for your child to be seen is about the age of 1, or about six months from the time their first tooth erupts. We can look for potential issues with emerging teeth as well as jaw growth. PREGNANCY – Always inform your dentist if you are or believe you may be pregnant.